Quiet country cottage on Davis Creek, a beautiful year-round mountain stream. Field, forest and mountain views in all directions. Located on a 18-acre parcel of property minutes down a scenic road from US 29. The property affords walks along the creek and meadows beside the creek. Area attractions include the 151 Wine and Brewery Trail, restaurants, hiking trails, antiquing, orchards and music festivals. The Cottage on Davis Creek is good for couples, solo adventurers, and families (with kids). Comfortable, well-appointed 800 square foot cottage with two private bedrooms, a full bath and a common room with a 40″ flat screen TV and pull-out couch. 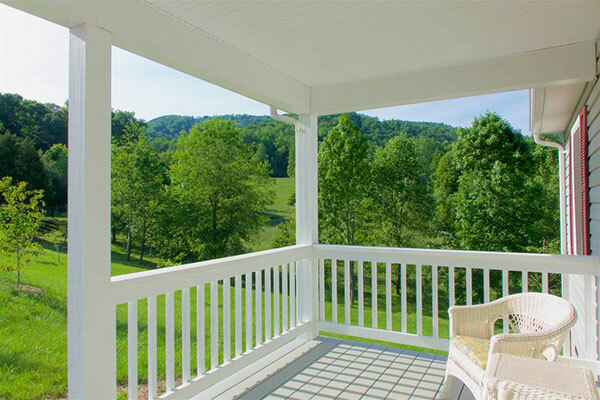 Front porch and back deck overlook Davis Creek and surrounding mountains and pasture. Easy 2-3 minute walk down a footpath to a private picnic spot on the creek bank. The cottage has a full kitchen and central heat and A/C. A wood burning fire pit (and wood supply) is available.